Yesterday, I'm on the phone with my mom. I'm talking about how I'd like to make a Valentine's Day dinner, but I can't come up with any ideas that are easy and wouldn't take hours and hours in the kitchen. Mom's solution? Try her made-up recipe for chicken marsala. Now I am a sucker for chicken marsala. I lament that there is not a Macaroni Grill within a 100-mile radius of our house... and other chicken marsalas at other restaurants have let me down. (Now, don't get me wrong, Macaroni Grill is not the BEST ever, but it is edible... and edible is where I draw the line.) I'm a bit of a food snob on this issue. Mom swore that I'd love the recipe and that it would be quick and simple. Quick and simple, yet taste good? I had doubts, but her stuff has always worked out before, so I made my list and headed out to the store. I have to admit, after I made it, I had to tip my hat to Mom. Yum! Behold! 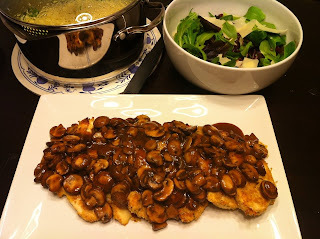 Chicken Marsala with Garlic Broccoli Pasta side and Candied Pecan Cranberry Salad with Parmesan Flakes. All done in under an hour (cook time). I'll break the meal down into three separate recipes so you can make one or all of the dishes as you choose. Parmesan cheese wedge (I purchased a wedge about the length of my hand and used it for the marsala and the salad, I still have half a wedge left.) You need enough to make 1 cup of grated Parmesan. 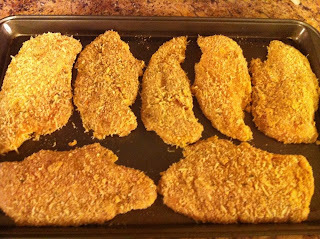 Step 1- About 45 minutes before I planned to start cooking, I left the chicken breasts on the counter to get closer to room-temperature. I didn't count this as part of the prep time, but I did set a timer so I wouldn't forget when to get started. Step 2- Preheat the oven to 350 degrees and spray a baking sheet with non-stick cooking spray. Grate your parmesan (1 cup) and place into a bowl with equal amount of bread crumbs (1 cup). Mix together. In a separate bowl whisk two eggs and set aside. Step 3- Open your chicken and pat it dry. Then, place it in the bowl with whisked eggs, covering both sides of the chicken. Then, coat with bread crumb/parmesan mixture and place on the baking sheet. Do this with all of your chicken pieces. Step 4- Bake at 350 degrees on middle rack of oven for 45-55 minutes until chicken is cooked all the way through. Turn once halfway through cooking. Outside coating should be a nice, golden brown on both sides. Everyone's oven is different, so keep an eye on it towards the end to ensure it doesn't get over/underdone. Step 5- About 15 minutes before your chicken is going to be done cooking, ﻿heat a large saute' pan over medium heat. Drizzle with olive oil (about a Tbsp. or so) and add your pre-sliced mushrooms. Stir for about 3-4 minutes and then add garlic paste. I added about a Tbsp. of garlic paste to the mushrooms. Stir until mushrooms are coated. Next, add gravy packet and 1 cup of wine. Stirring well. Bring to a simmer (stirring often) and then lower the heat. Continue simmering until it's the consistency of a nice, thick gravy. Then remove from heat but keep warm. Step 6- Once your gravy/mushroom mixture is done, your chicken should be about ready. 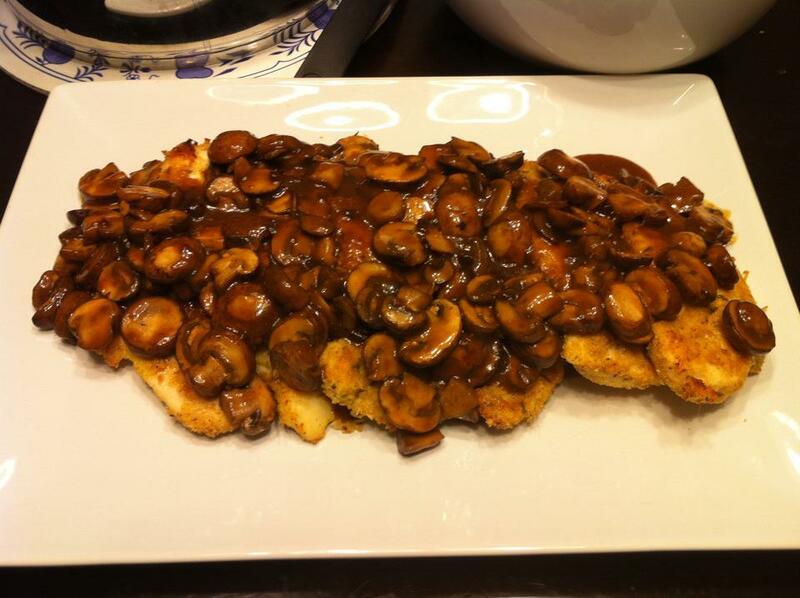 Once chicken is finished, remove from oven and pour mushroom mixture over top. Serve nice and hot. 1 package of frozen broccoli florets in a steamer bag. Step 1- In a large pot of boiling salted water, cook noodles. Drain. In the meantime, pop your broccoli florets in the microwave and steam according to the bag instructions. Chop into fine pieces... careful, it's HOT. 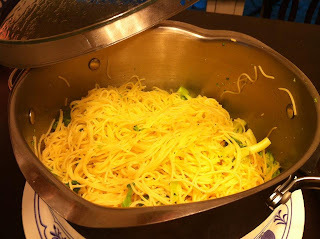 Step 2- Return noodles to pot and drizzle with olive oil. (Honestly, I didn't measure. I just drizzled around the pot, stirred and drizzled a little more. NOT greasy, but lightly coat the noodles.) Add about 1 1/2 Tbsp. of garlic paste and the steamed broccoli floret pieces and mix well. A little salt and pepper and you're done. This is extremely easy to swap ingredients and add/subtract whatever you'd like. I made this for the whole family, but you can modify for a single portion. Step 1- Wash your salad and put in a large bowl. 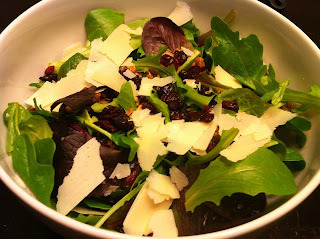 Then, sprinkle sunflower kernels, candied pecans, and dried cranberries on top. Step 2- Using a potato peeler, peel off strips of parmesan cheese from the wedge. Break the strips into shorter strips and sprinkle over the top. Step 3- Portion out your servings and top with balsamic vinaigrette dressing.